The use of child labour in tobacco growing is very dangerous and is prohibited worldwide. Despite this, there are children working on plantations in all the major tobacco-producing countries. As a result, many contract the Green Tobacco Sickness and have a high risk for pesticide poisoning. In Malawi alone, there are about 78,000 children working on tobacco plantations. But child labour is also widespread in other countries such as Brazil, Indonesia, the USA and other countries. Children start at age 5 to prepare seedbeds by turning the soil and felling trees. They weed the fields, they fertilise the tobacco plants and spray pesticides without protective gear. During harvesting the green tobacco leaves, children are exposed to the risk of contracting nicotine poisoning, because nicotine of the wet leaves gets absorbed through their skin into their bodies. A small amount of the neurotoxic substance already causes a severe nicotine poisoning called Green Tobacco Sickness. This sickness causes nausea, vomiting, headaches and dizziness. Research conducted by Plan International shows that child workers in Malawi might absorb up to 54 milligrammes of nicotine through the skin per day. This amount is equivalent to the nicotine contained in 50 cigarettes. Why do they work in tobacco growing? Working on tobacco fields, these children contribute to their families’ income to make ends meet. Due to the low prices for tobacco leaf paid by tobacco companies and plantation owners, tobacco farmers struggle to make a living. As a result, farming families are forced to grow more tobacco than they can manage by using the adults’ workforce. These farmers cannot afford to pay seasonal workers, while children and relatives are mostly not paid. Thus tobacco farming is usually family work. Why is this child labour bad? Furthermore, this type of work interferes with the children’s development and impedes their education, thus baring them from escaping the cycle of poverty. Moreover, children working on tobacco fields are exploited, because they are not paid for their work. According to article 32 of the United Nations Convention on the Rights of the Child, children may engage in work that is not hazardous and light in nature. This is not the case with tobacco farming: Therefore, children under 18 should not be allowed to perform any tasks related to the production of tobacco. How to prevent child labour in tobacco growing? Tobacco companies must pay higher prices in order to enable farming families to live on their work without involving their childrenin hazardous work. Corporate Social Responsibility programmes of the tobacco industry as well as industry funded organisations such as the Eliminating Child Labour in Tobacco Growing Foundation are only white washing the corporations’ image. Basic rights of farmers and workers on tobacco plantations e.g. in Malawi have to be respected. They need legally enforcable contracts and sufficient payments. 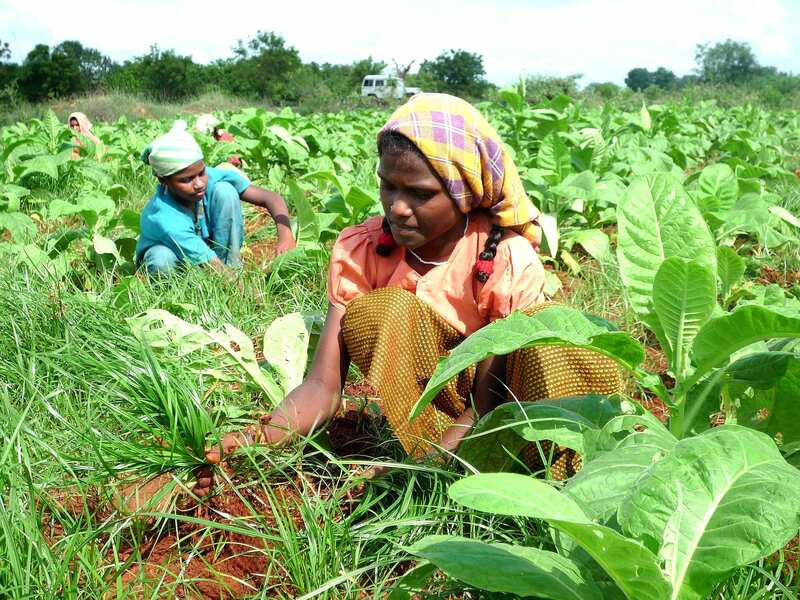 Tobacco farmers and workers need alternative livelihoods to tobacco. The UN Convention on the Rights of the Child stipulates compulsory primary education which has to be enforced. Moreover, there is an urgent need for more schools in tobacco growing areas (e.g. in Malawi). School meal programmes are a good incentive for parents to send their children to school. Particularly if locally grown food is used to feed the students, it creates opportunities for alternative livelihoods in tobacco growing areas. These are the countries where children work on tobacco fields: Argentina, Brazil, Cambodia, Indonesia, Kenya, Kyrgyz Republic, Lebanon, Malawi, Mexico, Mozambique, Nicaragua, Philippines, Tanzania, Uganda, USA, Vietnam, and Zambia. In India and Bangladesh children work in the bidi production. Tobacco is his life: watering plants, collecting worms, weeding, harvest ripe leaves, and sort them. During the harvest, Rahmad is often in the fields instead of school. Bangkok, 10 March 2017: The Southeast Asia Tobacco Control Alliance (SEATCA) calls upon the International Labour Organization to end its ties with the tobacco industry. Food security, or tobacco only? The New Alliance for Food Security and Nutrition (NAFSN) in Malawi cooperates with tobacco companies, thus ignoring the country’s urgent necessity to move away from its dependence on tobacco exports.